After finishing The Gardens Between, the first thought in my head was, “being a kid can be hard, huh?” I don’t want to spoil the ending, but while you’re never really in charge of what happens to you throughout your life in a sense, there’s a specific lack of control you experience when you’re growing up. Depending on how things go, your entire life can change in what seems like an instant, and you don’t have much of a choice but to let it happen. This extends to adult life of course, which makes me wonder if that’s why nostalgia-driven power fantasies are so popular. It’s not just that we want to be the hero of our own stories, but it’s that sense of control that affords us what we don’t normally have. Then once the game is over, it’s gone as fast as it came. This is The Gardens Between. The Gardens Between follows next-door neighbors and childhood friends Arina and Frendt as they take a metaphysical journey of sorts through the memories of their friendship, driven by an event I alluded to before that would be a big ol’ spoiler. This journey is punctuated by key moments in their lives together, points of sentimental significance like they time they helped each other fish a jacket out of a sewer drain, or watched a movie and threw popcorn at each other. These memories are presented in diorama-like levels, with Arina leading the way through a linear path with her special lantern. But the way is sometimes blocked, and the linear passage of time makes retracing those steps difficult. Except here, in this journey, time is trivial, and can be turned back and forth, manipulated within certain restraints. This is where you come in as the player. You don’t have much control over Arina or Frendt, but you do have control over the flow of time. You can move it forward, or roll it back, while Frendt is able to pull certain levers, and Arina can set her lantern down on certain spots. These are the constants, and where the puzzle-solving comes in is everything else. While you are primarily moving time back and forth, each level has some sort of unique trait or obstacle (or set of obstacles) that can also be manipulated in some way. What this means can vary wildly from level to level, and can often bend the rules established by the controls. While for the most part you’re either pressing “play” or “rewind” in a sense, some parts of levels can affect permanent change that helps you make it to the end. One example is a giant saw you can indirectly move back and forth to cut open a path. Much like the recent Donut County, The Gardens Between wants to be a puzzle-like game, but one that you can chill out and “experience” rather than play to “beat.” There’s no time limit, no scoring system, no dangers in any of the levels. You can take your time, vibe out and listen to the relaxing music, take on the challenges at whatever pace you want. But puzzle games are ultimately at the mercy of their design and internal sense of rules, and The Gardens Between sometimes stumbles for the sake of its high-minded concept. Combining the time manipulation concept with a rotating diorama level and inconsistent rules make for a sense of surrealist wonder and surprise, but the puzzle design can suffer, and betray the intent to make things breezy and stress-free. Sometimes the camera can obscure important details, and it’s hard to tell in certain instances if it’s deliberate or not. But when it happens it inadvertently brings a trial and error feel to those sections. Due to the obstacles being so unique, sometimes it’s frustrating to even discover some of the more abstract functions. This doesn’t happen often at all, but it can make that moment of discovery feel less earned, and more tripped over. 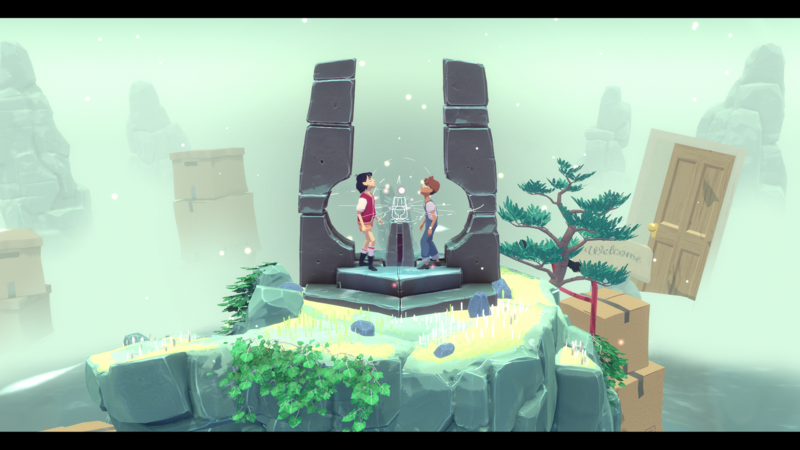 Beyond those couple of snags, and really, those snags just remind us designing puzzles is a human effort, The Gardens Between stands out among its physics/puzzle/metaphor-driven peers. It’s beautiful to look at and listen to, gratifying to solve (most of the time), and in the the end tells a simple story that’s just bittersweet enough to sting your brain into thinking about your life a little. The Gardens Between review code provided by publisher. Version 1.01 reviewed on a Standard PS4. For more information on scoring please see our Review Policy here.